Download the latest issue absolutely free! No need to call to cancel, and your credit card will not be charged for any LandOwner Newsletter issues (unless you choose to subscribe following your trial period). It truly is risk free! Get key moves to protect your rights as a land owner,�plus, you'll receive insight into practical ways to handle land ownership transfer from one generation to the next. A "must have" resource for both operating farmers and landlords. This eight-page publication is published twice per month and follows an easy to read format, allowing you to quickly find the information you need. 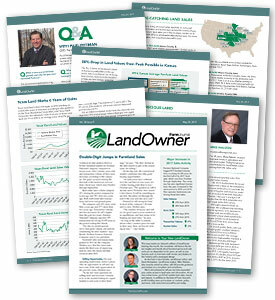 Pages 1-3:�News alerts, analysis and insights on key trends in the economy, Washington policy, ag markets, farm land prices, cash rents, ownership transfer, and interesting farmland sales. Page 4-5:�Lists recent farmland sales. Pages 6-8:�Covers price trends in corn, soybeans and wheat - the underlying generators of cash for farmland.